I had actually written and finished this Friday, but I was so exhausted by the end of the day that I slept without hitting publish.. so here it goes.. I am proud to report that I am ticking off three of the five on my list last week. 1. Write on the postcards I meant to send out to friends in Manila. 2. Work on the hem of at least one pair of pants. 3. Report on my progress with the THANK YOU POSTCARD PROJECT. 4. 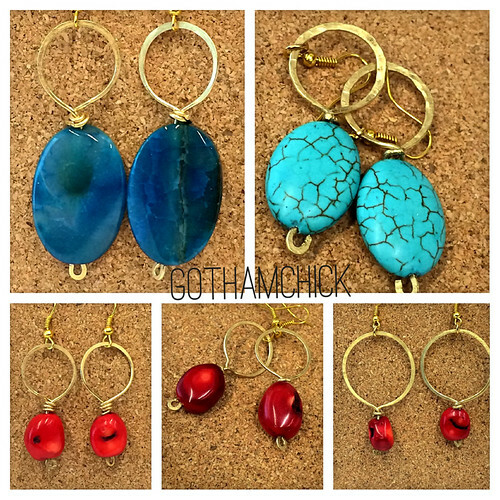 Create a pair or two of earrings from my polymer clay discs. Save for the pants, I might even be able to belatedly take no. 3 off soon, too. 1. Finish the pieces for posting to the shop. The polymer clay disc pieces and the non-polymer clay ones are just up for finishing, photographing and posting. Target for the weekend: at least one. 2. Work on the hem of at least one pair of pants. Still trying to get this done before the fall is fully present in NYC! 3. Write a post in the other blog, THANK YOU POSTCARD PROJECT. I’ve been working on this and there is much to report. If only I could find the time to sit down and write. 5. Create one of my Marian necklaces. About time, considering the request from Lou came a while back. I’m seriously thinking of renaming this the Saturday Five because I always end up doing them on a Saturday. But it doesn’t sound quite right. 1. Write those letters. I will still try. 2. Post those earrings! I actually managed to post five items and these are now available in the shop. 3. Work on the Thank You Postcard Project page. Been working on it but not the the site itself iwhich s private for now and I have it as a separate blog from this, but I have started uploading to its Instagram Account. Below is one of the first few I’ve uploaded and you can search for it via hashtag. 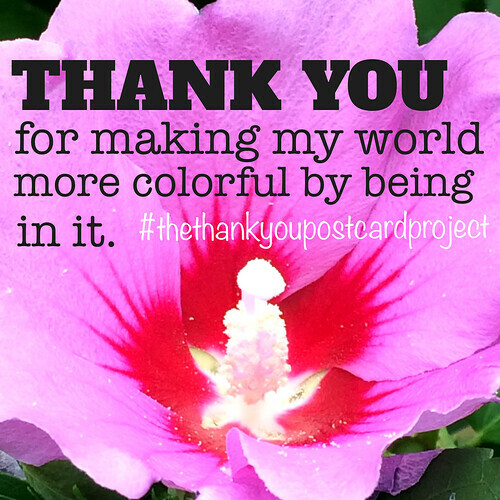 (#thethankyoupostcardproject) These are also available on my Pinterest account. 4. Send some test postcards out. I’m pulling back on this for now because I want to make some specifically to test with. I don’t want to touch what I already have in the 200+ postcards with backgrounds ready to be worked on. 5. Bake some polymer clay pieces this week. I’ve been pouring a lot of work into polymer clay and so far I’ve managed to make maybe half a dozen beads and molds, but my major polymer clay experiment fell flat. But that’s what experiments are for, so I’m glad to report that I am at least working on it. 1. Write those letters. I will still try. I am working on some handmade cards and might even come out with a tutorial in Gotham Chick (my craft blog), so at least one card, I think will go out. 2. Post the almost finished bracelets and necklaces in the shop. I have some mother of pearl bead bangles that are ready for posting but need some finishing because of the extender chain with charm I wanted to add. That should be done this weekend, and he posts up before next Friday. 3. Finish at least one more background at the end of my altered book. 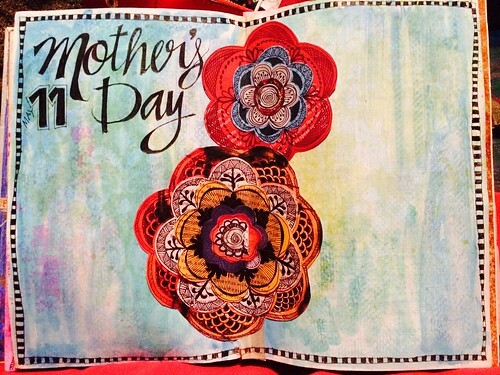 I’ve gone back to art journaling and was just finishing one layout for an entry, but I have around 20 spreads in the book that are still plain book pages. The idea is to create journal ready spreads as I go along. One or two more entries in the back of the bok would be nice. 4. Destash more magazine by going through them and getting what I need. 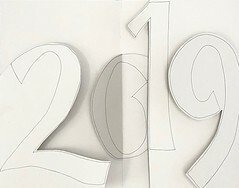 I have been cutting out letters connected to the Thank You Postcard Project and hope to do that with the other magazines I mean to throw out. It might seem like I’m rehashing the previous week’s list but that’s the whole point of this. I created this list to help me focus on deliverables that are achievable, and I like that it’s kept me committed to ticking off something each week. It was beautiful yesterday but the clouds are back. Not a happy morning outside but I’m not complaining because the sun is going to be tolerable. Hope everyone is having a good Saturday! I was hoping to be halfway done with the altered book I’ve been using for my Art Journal Every Day entries by now, but the problem is that I haven’t been too good with the “every day” bit. 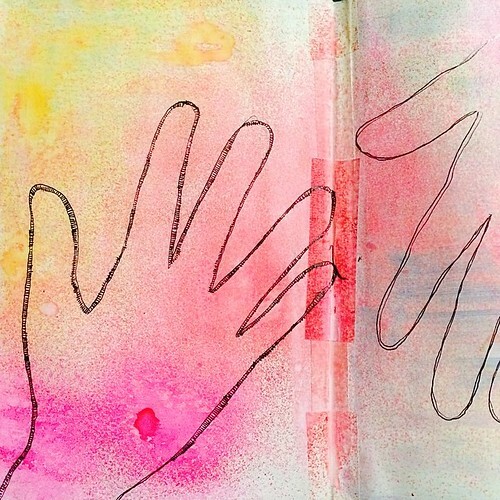 Weeks to even a month between posts have practically ground the art journaling to a halt. 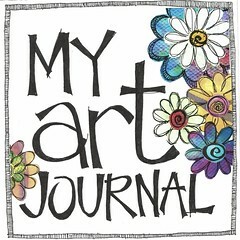 But I have picked up the Art journal again, so there is hope. I thought I’d do a “Thank you” post, more so since I’ve been trying to kick off a project. It’s something that I’ve been playing around with in my head and something I’ve been doing some mail art to prepare for. We just don’t say those two words enough. On the other side of the spectrum, a simple thank you in our hands can make such a world of difference. I’m pulling together a Thank You Postcard Project by repurposing old advertising free cards into mail art with a visual “thank you.” I’m using my stash of decorative/fancy table napkins, subway (and other) maps and other background materials to cover the original print. I’m even using some of my original photography in some. I’ve probably pieced together close to a hundred of my doodled flowers and I just can’t stop. It’s not about me thanking you. I want to give you the medium to say “Thank you.” It’s about saying thank you with a postcard.. more to come. I’ve been struggling a little with getting on with the art journaling. It’s mostly been sitting on my bedside table untouched the last couple of days, so I had quite a bit to catch up on. The weekend somehow gave me the chance to do an entry and a half (the other one still in progress), and I’m happy to be art journaling again. This page had a totally different background before I started working on it again. I wasn’t quite happy with a white page I had stamped on primarily because the pigment ink was “staining” the opposite page. Gesso to the rescue! I put on a thin layer to cover the previous watercolor/stamping, and although some of the blue on the right hand page seeped through, I think it covered it pretty well, allowing me to use ink spray to create a totally different background. It was “muted” by the gesso and the direct application, but I like the effect after everything had dried. It made the masking tape holding the page together more obvious — I needed to do some book first aid with the binding falling apart on me, but I think that added to the layout’s charm. 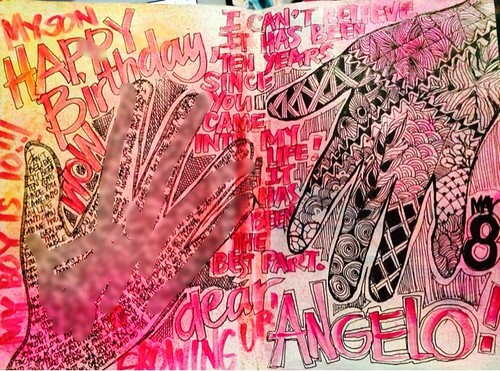 Art Journal Every Day: Celebrating my boy’s 10th birthday by doing a spread with his traced hand on one side and mine on the other. Still a work in progress. I haven’t been too good with the “every day” part of the project but trying to catch up. With my little guy turning 10 last Thursday, I’ve had a very busy week. Goodie bags had to be packed, the cupcakes bought, and then I hied down to school for a 20 minute appearance that saw him beaming. As we walked home together, he proudly told me it was a good birthday. That was precious..
His birthday will always be very special to me because it marked a very big change in my life. While I wasn’t even aware until the last couple of months of how much more profound that change actually was, I cannot be more grateful for the blessing of having this little guy as my son. He truly makes everything worth it. 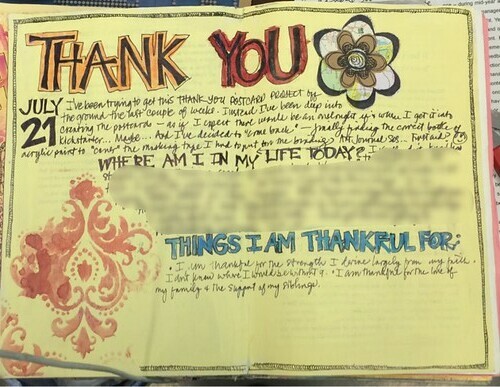 I have only a few copic markers which I used to write the text around the actual journaling, and while I was reluctant to “fill up” the page, it felt quite bare without the other text. I wanted it to be busy and “full”…An entry all about my little boy who isn’t so little anymore. The palm of his hand is almost the same size as mine — but I like the feel of holding his tinier hand because it still makes me feel like the mom holding that hand in mine. Time flies, indeed! I keep telling him I wish he wouldn’t grow up so fast. I feel like the passing of time will see him drift away as he grows up and joins the world out there. That is both frightful and terribly exciting for me as a mother. He has been such a gift to me. Every day, I thank God and I pray He keep him safe. Meanwhile, here’s the half-done (not quite) page I’ll be working on next. There was a three-inch gash tearing through the binding, so I thought I would remedy that by pasting these paper pieced doddled flowers I had inserted into the back of the book for use somewhere within the journal. And here they are. More on this journal entry later. Daily Prompt: Never been mellow? Me? DAILY PROMPT: After a long day at work or school, what are your favorite ways to wind down and decompress? I work 5 days a week, and I usually don’t end my day until closer to midnight. I do get a chance to unwind an hour or two (if I’m lucky) before I finally go off to bed after the dishes and the food left over from dinner have been taken cared of. It’s Friday and I’m trying not to overthink the prompt, so let me just enumerate the things that I do to wind down, spend some “me” time, and just chill. 3. 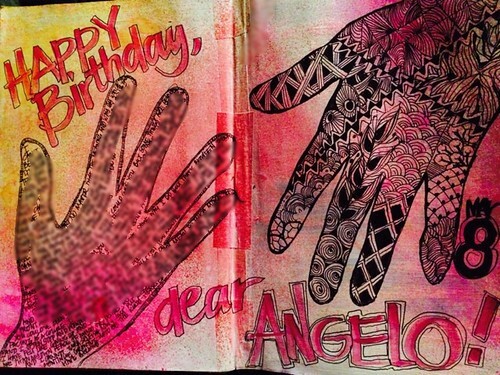 I write/draw an entry into my Art Journal, or do a background further on in the altered book I’ve been using. Two projects in one. I try to write a sentence or so everyday although sometimes, I don’t have the energy even for that. Last night, I scribbled a line. It’s a line a friend had shared with me. Gives me pause to think even when I’m just doing the lettering or fonts without actually scribbling an entry. I like the way my art journal has evolved because now I dare to draw faces, and I am getting more disciplined in doodling — so much so that I actually make an effort to stay within the rather strict zentangling guidelines of sticking to “official patterns”. 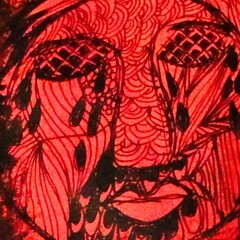 But it’s the daily exercise of actually getting something down on the pages of the journal that provides me a release. 4. I play slots online — but only for free, never for pay. There’s something about the rolling of the slots that I find relaxing. Maybe it’s hypnotizing me into playing some more? I never click on the purchase credits, though, and I wouldn’t dream of gambling. I just like going through the motions even if there is actually no monetary reward involved. I’m not really a highly-strung type of person except when I’m upset. No matter how busy life may get, I coast along and take life as it comes. Emotions are a different thing, though. When it gets rough and I am on the verge of whatever, I pray.